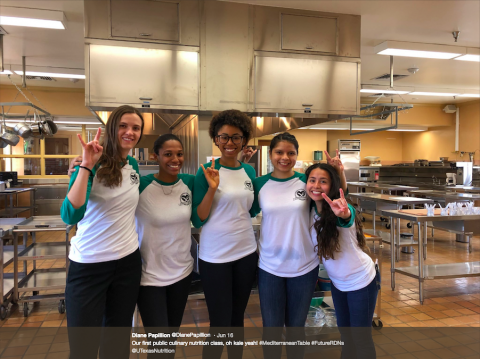 While some Longhorns lazed by the pool this summer, a few undergraduate nutrition student volunteers and students in the Coordinated Program for Dietetics (CPD) turned up the heat…in the kitchen. 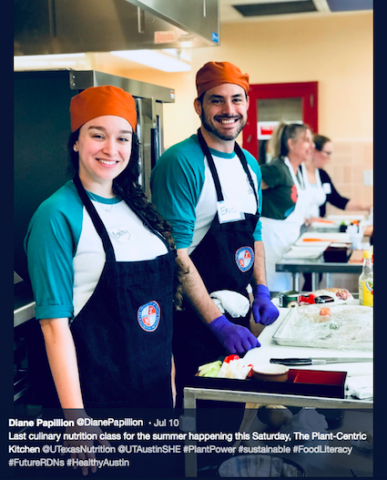 A new culinary nutrition program, Susie's Kitchen, kicked off this summer with four unique installments featuring hands-on days of cooking, nutrition exploration and food science education. Open to the general public, attendees at the sold-out events ranged from the UT community, alumni and other local Austin home cooks. 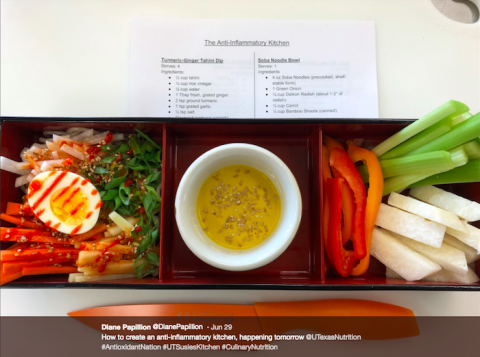 Under the direction of nutrition professor, Diane Papillion, CPD students developed educational curriculum, enticing menus and full food demonstrations for classes with topics spanning Mediterranean, Fermentation, Anti-Inflammatory and Plant-Based diets. 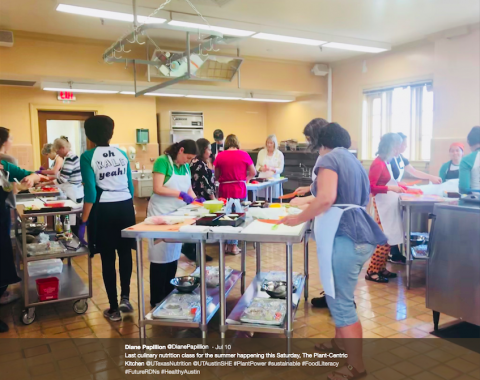 During the events, participants started their day in an engaging classroom discussion followed by recipe demonstrations by knowledgeable student instructors and finally prepared hearty, healthy lunches to fit the theme of the day. Behind the scenes, students spend hours preparing for flawless class days. From the initial menu planning, menu scaling for 20-25 participants, shopping, prepping and cooking, the CPD crew and a few volunteers covered everything. It was truly an experiential learning program where students executed a very professional and comprehensive culinary nutrition class that was enjoyed by all. It was truly an experiential learning program where students executed a very professional and comprehensive culinary nutrition class that was enjoyed by all. During the plant-based kitchen, attendees learned how to maximize each food used, focusing on ways to build a sustainable food culture. A can of chick peas (garbanzo beans) was used in 4 different ways: roasted garlic hummus, as a base for a vegan Caesar salad dressing, roasted as a topping for sweet potatoes and even the liquid from the can was transformed into a vegetarian dessert. The viscous liquid left over in a can of chick peas is rich in complex carbohydrates and proteins and can be whipped into a stable foam – much like egg whites! Using a few simple ingredients, this usually waste product was whipped into a light foam and added to melted dark chocolate to create a rich, yet delicate dark chocolate mousse. Through this demonstration, participants learned how to make a dairy, egg and gluten free dessert that actually tastes good and didn't require a special trip to the grocery store. 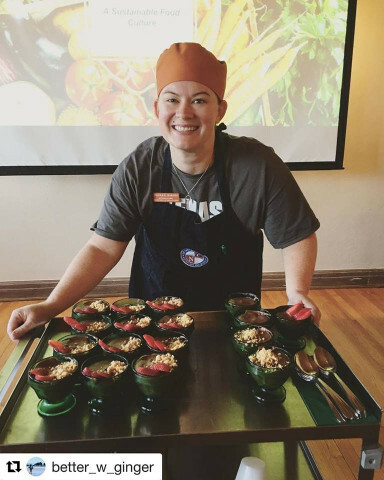 With curriculum spanning nutrition, evidence-based application, food science, community education and natural sciences, UT's nutrition students are uniquely prepared to flourish as dietitians, culinary nutritionists, cooks and educators. Follow the UT Nutrition Instagram to stay up to date on student successes and more opportunities like Susie's Kitchen!